Moving can be stressful and a chore any time of the year, but winter moving is especially tiresome when you have to deal with snow, sleet, ice and freezing temperatures. It’s also a time of year when most people want to be sitting down next to a warm hearth with food, family and friends, not packing up their belongings and looking for a moving company. 1. Be careful with temperature-sensitive items. Packing for a winter move is very similar to packing for a move any other time of year with one exception. You need to be careful with items that can be damaged from the cold. Some are obvious, like house plants. Others may not be so apparent, such as old china pieces that may crack or get fine lines in the extreme cold. 2. Add a little holiday cheer. Even though you have you whole house torn up, if moving during the holidays, you can still add a little holiday spirit and warmth to your home. Consider a small, portable tree that can move with you or a wreath that can easily move from your old front door to your new one. 3. Be flexible. Even the most reliable moving company has no control over closed highways and blizzard-like driving conditions. 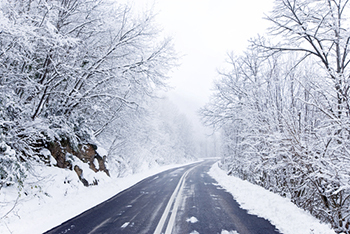 When planning a winter move, it’s best to have a contingency plan in case the weather doesn’t cooperate on moving day. 4. Keep the sidewalks and driveway clear. Keeping your sidewalks shoveled is important any time it snows, but when movers are carrying heavy boxes and furniture in or out of your house, it’s especially critical. This is an important winter moving tip to help prevent anyone from getting hurt as the movers navigate slippery walkways. 5. Keep the heat on. Although it may be tempting to have your utilities disconnected early if you’re already sleeping somewhere else, you’ll want that heat come moving day. Having the door opening repeatedly will send that cold air all through the house. 6. Move your pets first. Although this is a good idea any time of year, it’s especially important if you’re moving in winter. Get your cat and/or dog to a warm, secure place before the movers descend on your home. You don’t want them to sneak out of the house and get lost in freezing temperatures. 7. Cover your floors. Winter brings all kinds of mud, snow and slush. You don’t want the movers to track all of this dirt and debris into your house, even if you are moving out. Protect your carpets and floors by covering them with plastic drop cloths. Be sure to anchor them securely, however, so the movers won’t trip on the edges. To learn more about how to organize a winter move and how to make your move as easy and stress-free as it can possibly be, contact Red Ball for a free moving quote. We have more than 90 years experience in helping people like you move across the state or across the country. We operate in all 50 states and are adept at offering quality service at an affordable price, no matter what the season.